This Baltimore County medical malpractice lawsuit involves allegations of a failure to diagnose, treat, and monitor a cardiac patient for sudden death heart arrhythmia. Patient presents to St. Joseph Medical Center with a recent history of near syncopal episodes (fainting/passing out). He does not report any chest pain and his cardiac history is unremarkable. During his admission, Patient manifests mild EKG changes consistent with a prior inferior wall infarction. He later undergoes cardiac catheterization, which reveals that he has an ejection fraction reduced at 35% to 40%. An ejection fraction is a measurement to determine how well your heart is pumping out blood. Normal rates are 55% to 70%. The patient is discharged with a diagnosis of stress cardiomyopathy, a condition where stress can cause rapid and severe heart weakness. The Defendant Health Care Providers never diagnose or suspect the possibility of sudden death arrhythmia, notwithstanding the fact that he has an abnormal ejection fraction with numerous and continuous near syncopal episodes, no notable cardiac history, and no history of drug use. Instead, discharge instructions are limited to stress-induced cardiomyopathy, with no information regarding sudden death arrhythmia. Two months after the patient's discharge, he suddenly dies. The patient's mother claims he would not have died had the Defendant Health Care Providers properly diagnosed, monitored, and treated him for sudden death arrhythmia. Patient's mother, a resident of Somerset County, files a survival action, a wrongful death claim, and a failure to obtain informed consent claim in Baltimore County. She alleges that the Defendant Health Care Providers violated the standard of care by failing to properly and timely assess, treat, and monitor her son's condition, including the possibility of sudden death arrhythmia. Failed to properly and timely assess, treat, and monitor her son's condition, including the possibility of sudden death arrhythmia. Bruce Charash, M.D. - board certified in internal medicine and cardiology; licensed practicing physician in New York. Dr. Charash was also named as an expert in a lawsuit filed less than a month before this claim. Cardiomyopathy simply means that the heart is no longer able to squeeze or contract in an efficient manner to allow it to pump blood appropriately. Cardiologists evaluate this most often either in the cath laboratory or with an echocardiogram by looking at a value called an ejection fraction. Ejection fraction simply says what percentage of the blood that was taken into the heart is ejected out of the heart. The normal ejection fraction is 55 to 75 percent. As you drop below that level, you can be said to have a cardiomyopathy. The doctor apparently concluded that a low ejection fraction equaled cardiomyopathy and stopped there. 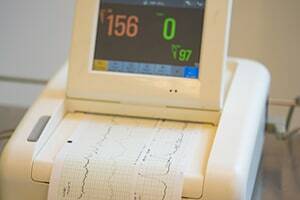 Plaintiff's claim is that because he had no other symptoms that would lead you to believe that there was not something deeper, the doctors should not have ruled out sudden death arrhythmia. Plaintiff argues that this man should have been placed on a wearable defibrillator and likely would have graduated to a traditional defibrillator. These devices have been recognized as preventing sudden death by arrhythmia with a 95-99% success rate. If you have suffered as a result of the negligence of a doctor, nurse or other healthcare provider, our law firm can help you. You are entitled to justice and monetary compensation for the needless harm that has been done to you. Miller & Zois has a very long history of results in medical malpractice and nursing home cases in Maryland, earning large verdicts and settlements. Call today to speak with a caring medical negligence attorney who can help you at 800-553-8082 or get a free online case review.